In order to examine the role of the super hero (in the post Skrull invasion-world), Reed Richards built a powerful time bending device that he called, 'The Bridge'. The moment he turned the machine on, H.A.M.M.E.R. forces arrived and tampered with Baxter Building's power supply. 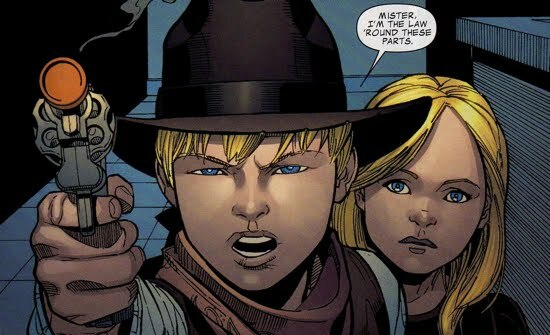 This sent the Sue, Ben, and Johnny on trip through various realities as Reed struggled to bring them back. To add insult to injury, Norman Osborn demanded to see the Fantastic Four's paperwork that allowed them to operate as super heroes and we not going to stop until he got it. Osborn was fed up with waiting for the Fantastic Four family to comply to his request, so he and Mac Gargan (aka Dark Spider-Man) arrived at the front door of the Baxter Building to force their hand. 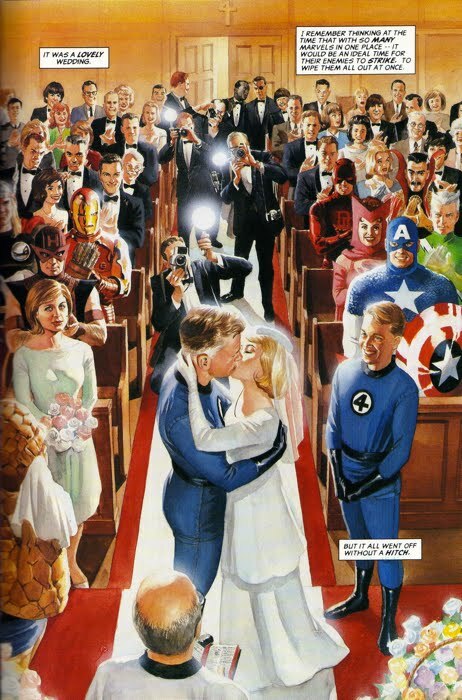 Osborn was greeted by Valeria Richards (Sue and Reed's daughter), who quickly haulted Osborn's plan to confront the family with a multitude of forces. Valeria cited Osborn's own documents that explicitly state only 'one' representative from H.A.M.M.E.R. would be meeting with Richards, so Norman was forced to leave the rest of his entourage at the door. Valeria took her trick one step further when she told Norman he won't be meeting with parents at all, that they were too busy. Instead, he'll be meeting with her brother Franklin. Norman was not very pleased with this outcome (as you could imagine) and he opened fire on the two children for their incorrigible behavior. Meanwhile, Reed was able to rescue the rest of the Fantastic Four from their time traveling escapade and, once home, they immediately intervened between Osborn and their kids. Sue placed Osborn in a force field along with the rest of the Fantastic Four, prompting Norman to summon the rest of his forces for help. 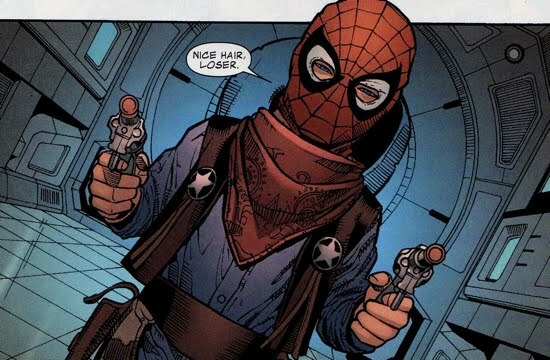 Norman's team was useless against the force field and Osborn had no choice but to listen to Reed's demands. He tells Norman to stay away from his home and his family for good, but Norman informed Reed that this conversation does not matter because their conflict is not finished. Osborn that lost his cool and pulled his gun on Reed, a shot was then fired, but it did not come from Norman's gun. 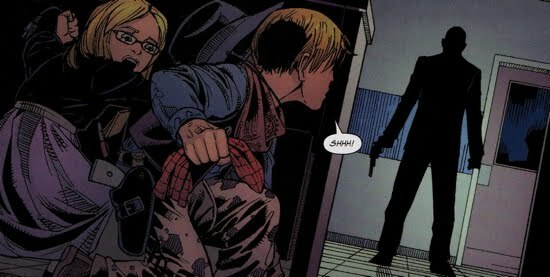 Franklin Richards fired a shot from what appeared to be a toy gun, hitting Osborn's right arm and drawing blood. Norman was then forced to leave the Baxter Building, but he swore revenge on the Fantastic Four on his way out. It did not take long for Osborn and the Fantastic Four to cross paths once again, this time, however, the Fantastic Four would be the aggressors. The quartet barged in on a party Osborn was throwing for various arms manufacturers, who had weapons contracts with the U.S. government. Contracts which Norman wanted for Oscorp. 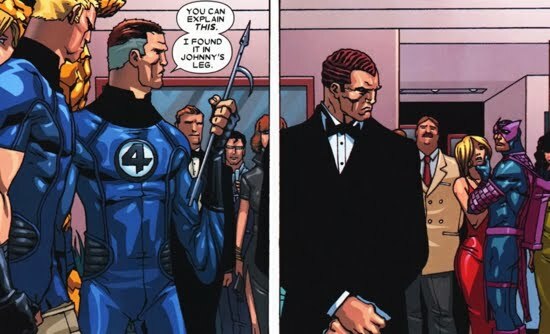 Reed and the group wanted answers for an arrow that they had pulled from Johnny's leg, an arrow which appeared to belong to Hawkeye. Hawkeye claimed that it was not his, or at least that the didn't attack Johnny Storm, but what most didn't know was that Hawkeye and Daken had a fight earlier that day in which he threw an arrow through Daken's shoulder. Awfully suspicious...especially since Daken had been taunting Hawkeye continuously over the previous few days. Osborn was able to pacify the situation and make the Fantastic Four look like the antagonists in front of his guests. Unbeknownst to the rest of his team, Daken made a surprise trip to the Baxter Building. Once he arrived, he used his pheromones to bait Ben Grimm into attacking him, it took the rest of the Fantastic Four to pull Grimm off of Daken. 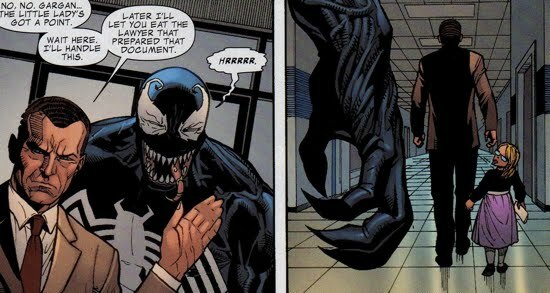 Eventually the team hears Daken out, he explained to them that he did not like what he was becoming as a part of Osborn's team. And he felt that Osborn's downfall, as well as a confrontation between the Avengers and the Fantastic Four, was inevitable. He proposed a deal to the Fantastic Four, he suggested that when that confrontation does come, he'll be their inside man. The Fantastic Four tentatively agreed to his offer, however, across the building a separate deal was being orchestrated. 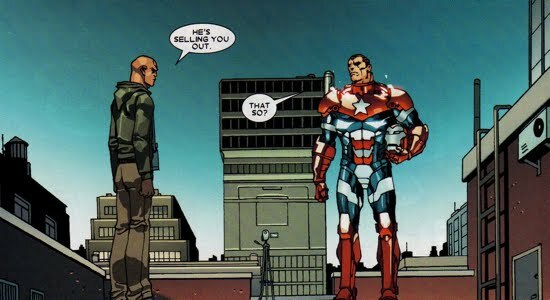 Daken did not make it to the Baxter Building without picking up a tail, two in fact, both Hawkeye (aka Bullseye) and the Iron Patriot followed Daken. Osborn became paranoid that Daken was selling him out so he sent him a text, 'Tell Reed I said Hi'. 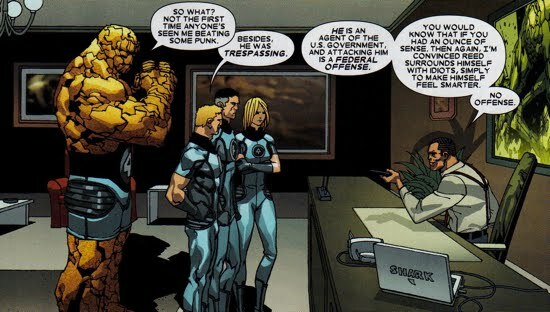 Daken knew the jig was up, so he requested the Fantastic Four pulverize him to make it seem like their negotiations went awry. Grimm didn't hesitate to make good on that request. But Osborn caught the whole beating on video tape, and when the Fantastic Four arrived at the Avengers Tower, Norman threatened to hand the video over to the media. Unless, of course, they met his terms. Norman wanted to full access to their facility, all their files, and all their plans or he would reveal the video to the public. Reed refused, and here is where the double-crossing gets interesting. As a part of Reed's uneasy truce with Daken, Reed had previously asked that this Dark Wolverine help him to gain access to all over Norman's files and plans (sound familiar? ), and Daken agreed. So, back to the present time, after Reed refused to allow Norman access to all of his files, Norman brought Ares and Gargan in to annihilate the Fantastic Four. During the ruckus that ensued, Norman destroyed all the files Reed would have had access to, however, Norman's black mail video tape was destroyed as well. A stalemate was reached, once again, between Reed and Norman, but Reed and Daken seemed to have a bit of an alliance as a result of all this double-crossing. This was the end of Reed and Norman's direct conflict while Norman led the Avengers. The Fantastic Four were amongst the super heroes that helped defeat Norman during his siege on Asgard. Reed knew Osborn would fall eventually he just waited patiently for the villain to unhinge himself first. Speaking of video footage...Norman using a video tape as black mail, again!?! Remember Spectacular Spider-Man #250...ol' Norman loves himself some good covert video-taping to help push his agendas! For completeness sake, these two events were not the only time Norman saw the Fantastic Four during his tenure at the top. Norman argued (briefly) with Reed Richards over how to handle the Zodiac situation. The Zodiac ordeal is summarized here. 2. 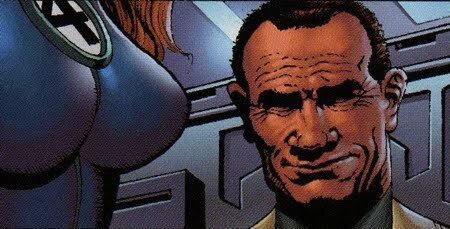 Reed's dislike of Norman goes back to his days as Thunderbolts director...Here's Norman sneaking an inappropriate glance at Mrs. Sue Richards, this sequence is from Penance Relentless #4. If he's not firing weapons at his kids, he's sneaking a peek at his wife...nice guy! 3. 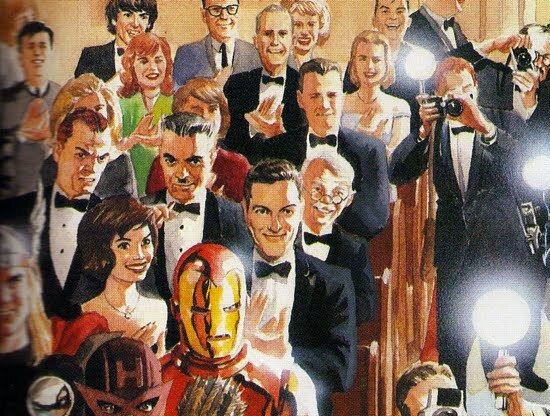 With the bad blood between Reed and Norman, it's interesting to note that Norman attended Reed and Sue's wedding. When did the rift between Reed and Norman begin?? It looks like Norman went stag to their wedding...with J. Jonah as his wingman.